Part of the Gordia Living Room Collection, our Gordia Wall Shelf is simply styled and a great piece of storage that’s ideal for almost every room. Our Gordia Wall Shelf is a great piece of storage for any room. It’s made from quality 16mm laminated board, so it has strength and durability as well as beauty. So it’s ideal for almost any storage from candles to glasses, ornaments and figurines, books, CD and DVDs etc. Shelves suit every room. So think where you could use them to tidy up some stuff and free up your floorspace. Store more – a lot more. This shelf is simple, stylish and stores a lot of stuff. So don’t be shy, put lots around your home. More savings than most. Why? Well for starters it comes from Dako. We also supply it flat pack. So less cost to make store and move it. So you get a Dako discount over the assembled price. Easy. 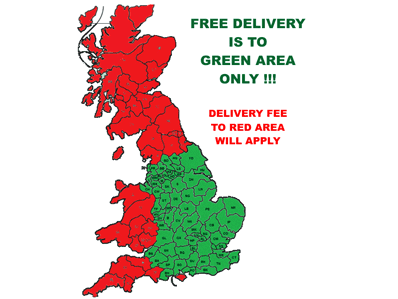 FREE DELIVERY is for the deliveries to GREEN Area on the map above only on a minimum spend £250. 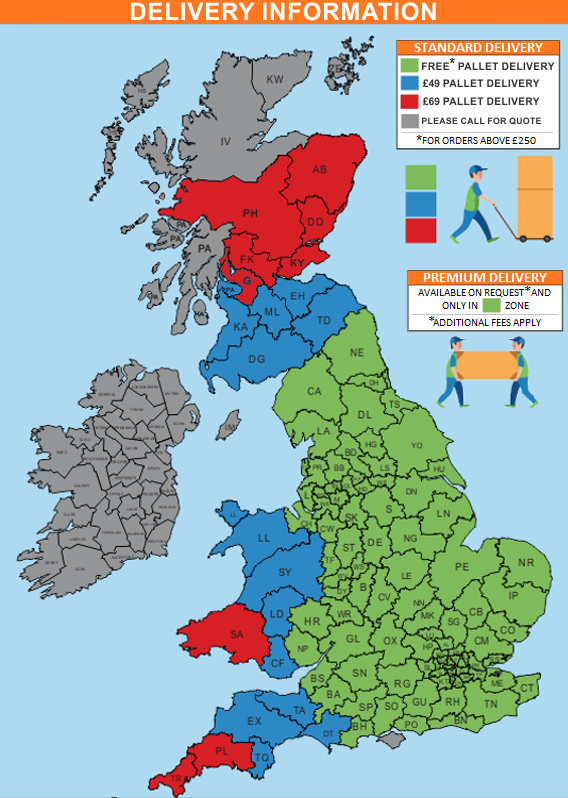 Additional fees will apply for delivery to RED and BLUE areas. Delivery charge is automatically updated upon checkout prior to order confirmation. When we plan our deliveries at DAKO we are not like a large multi-national parcel company who are making 40 to 50 deliveries of small items per day. Due to heavy bulky boxes, DAKO`s average day is 8 to 10 deliveries. Planning is extremely difficult as the majority of people are at work during the times we operate. We are not in every town in the country every day. We may only be in your area once a week. Therefore we need your help to help us with our planning. It is generally easier for you to re-arrange your schedule to help us with ours. Believe us when we say we are grateful for your help and understanding as we truly mean it. To help you manage your delivery day we will give you a morning or afternoon time slot. The driver will call you when he is at least 30 minutes away. If you need a phone call that allows you more time to get home then let the Jade office know in plenty of time. Normal delivery times are 8 am - 8 pm on working days. However, occasionally we will be able to offer weekend delivery dates. Buyer will be notified of a delivery date either by text message or call. Please ensure you supply correct contact details. If the goods you ordered are in stock we aim to deliver as quickly as possible usually within 1-10 working days. Normally delivery is within 4 weeks from the date of receipt of payment. Please note some items may be delivered slightly sooner or later than the above stated period (up to 6 weeks). When you place the order you will receive an automatic e-mail from us confirming the order. If you have an urgent requirement call us with the items you wish to order, your full delivery address and your latest delivery day and we will tell you if we can supply the products in time. Generally, where an order contains more than one item all items will be delivered at the same time once all items are available. to charge the customer a minimum of £25 to cover part of the cost of the failed delivery. This is not always the case as it depends on the courier company used for a specific delivery. Goods are delivered to the building door only and there will be no taking goods upstairs. The goods will be left inside your premises at the safest convenient location. Delivery drivers as standard will not carry items upstairs, and all transportation of your goods to a location upstairs is entirely carried out at the contractor's risk and discretion. PLEASE NOTE “carry items upstairs” also covers flats which are not located on the ground floor. Our drivers are unaccompanied; they will not move or take away any existing goods or property and will not carry out assembly or installation of the goods unless arranged. Other than where the Buyer acts as a Consumer the Buyer shall be deemed to have accepted the Products 5 working days after delivery to the Buyer. Loan calculator will give you only idea about your finance options that how much you need to pay on your selected option from the dropdown. To apply for finance, kindly add item into basket/cart and proceed with checkout to get Finance as a payment method to apply. Dako Furniture specialises in importing luxurious and unique household furniture from the largest European/Polish manufacturers for the UK market. © Copyright 2017 Dako Furniture Store UK. All Rights Reserved.